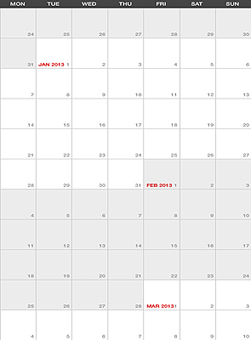 What a poor design most calendars are - they haven't responded well to how our culture uses them. Examples: most people divide a 7 day week into two parts - the work week (Monday thru Friday) and the weekend (Saturday and Sunday) yet most calendars split the weekend by starting the week on Sunday. I think most people, if surveyed, would say they start their week on Monday morning. 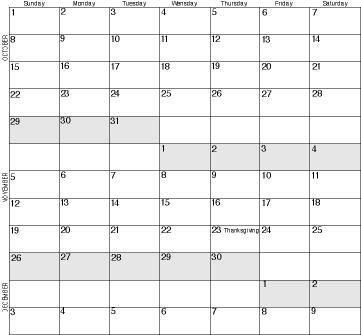 Another: most of us live and plan schedules by the week, even if a change of months breaks up a week. 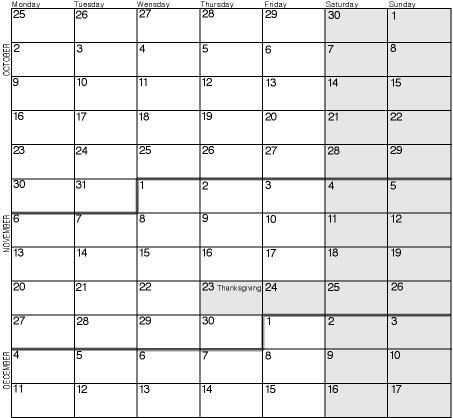 Most calendars split the year into distinct months, rather than keeping those weeks intact. 1. Starting the week on Sunday, breaking up the visual weekend. 2. Grouping days into month blocks. 3. Breaking up the weeks that cross the month changes. 1. It keeps the two parts of the week grouped together - the work week and the weekend. 2. It keeps the days of the week together, even if a month breaks fall during that week. 3. A lite grey screen over the weekends and holidays helps to visually distinguish them from workdays. Side by side, here are the standard and improved versions. 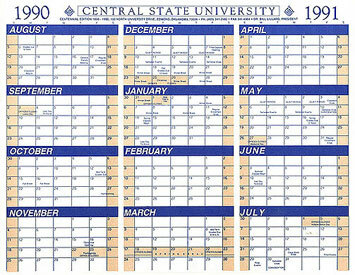 The University of Central Oklahoma (then called Central State University) publishes an academic calendar each year for planning purposes. Below is a sample. 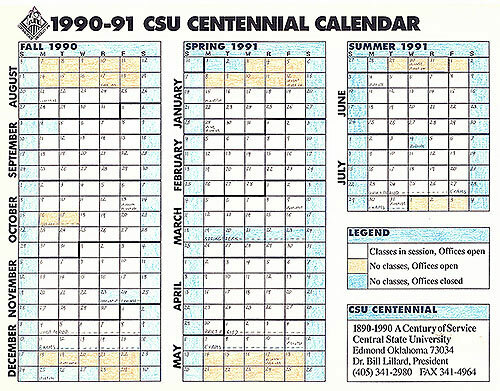 Realizing it was a poor design, I designed, in 1992, an improved version with the weeks not broken up by months and more color coding. I prepared the dummy versions shown below and presented them to the Vice President of Academic Affairs. He looked at it for a moment and considered how it would be used and immediately saw the value for more efficient planning. 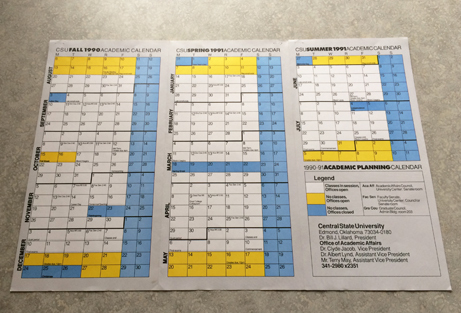 Faculty and staff think in terms of semesters and weeks within a semester, not in months. He saw how the unbroken months and semesters allowed at-a-glance understanding of the semester block. He had hundreds printed and distributed around campus. Side by side, here are the original and improved versions. 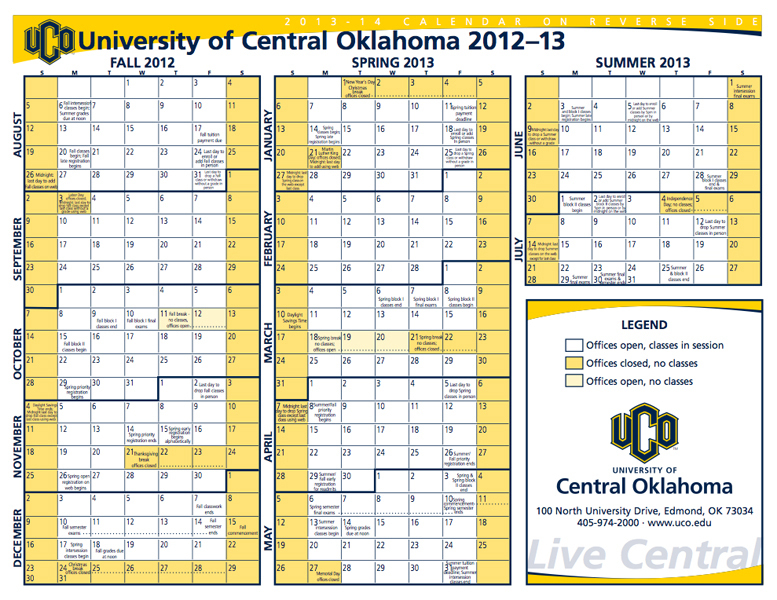 This sheet (below) of explanations accompanied each calendar sent out to the university community. Unfortunately, the Vice President's successor, a bit more fearful of change, lapsed back to the traditional inefficient version. 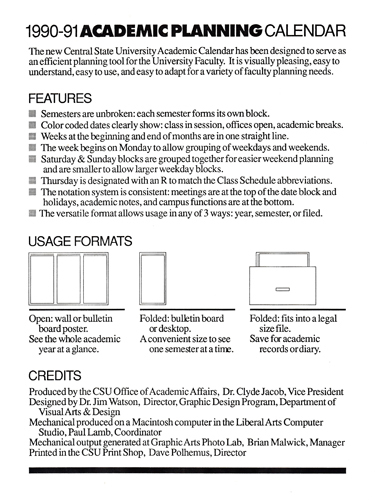 To try again, I presented the better format again in about 2004 to a new campus office called University Relations, now responsible for the academic calendar. However, the fear to try anything new prevented it from being implemented. These types of responses remind me of why I get so frustrated in Oklahoma; the land of "That's not how we did it last year", "If it ain't broke, don't fix it", "I like things just the way they are", and "If it was good enough for my grandfather, its good enough for me". 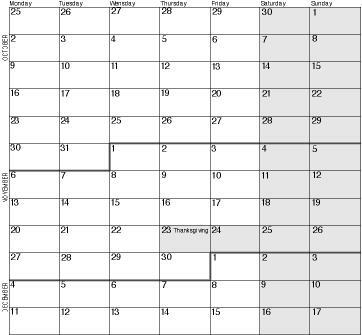 13 months of 28 days = 364 days + 1 World Holiday = 365 days, 1 year. Every four years there is a second World Holiday. • Each week starts on a Monday. 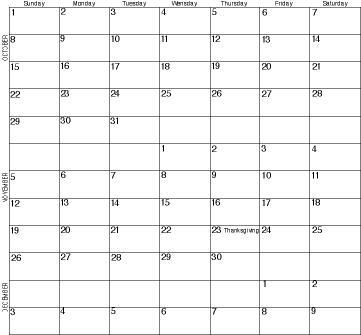 • Dates fall on the same days, the 4th of any month is always a Thursday. 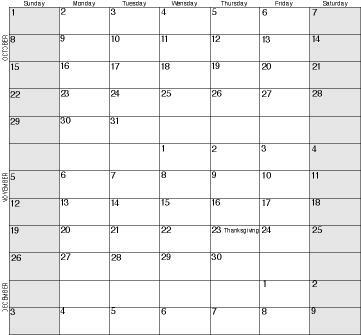 • Easier to plan and schedule events. 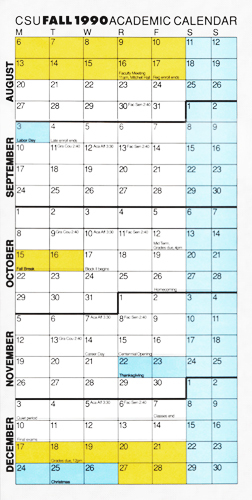 • Don't have to replace calendar each year, saving time and hassle. • There could be a global contest to name the 13th month. Less business for those who produce calendars. 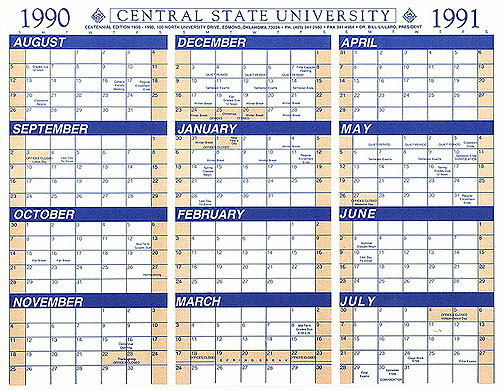 Wall calendars and annual datebooks will still be produced. 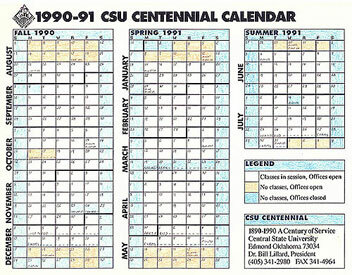 Calendars will wear out, be written on, and otherwise need to be replaced. In this digital age with calendar apps that are easily updated, this disadvantage is becoming less of an issue.